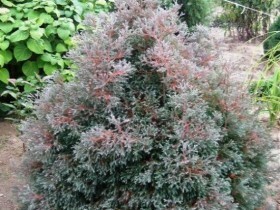 Thuja – popular varieties, how to propagate, care, artistic pruning, photo and video. 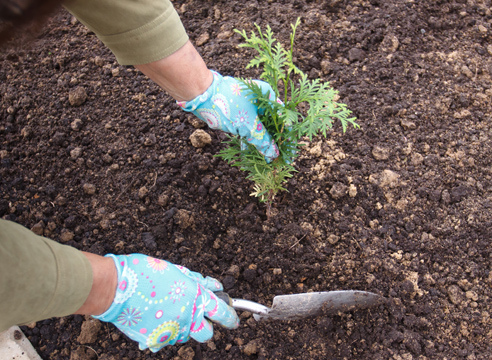 How to grow thuja from seeds? Artistic pruning arborvitae in the form of geometric shapes. A noble plant of the family Cupressaceae apply for registration of the plots has long been. The tree has an unusual leaf shape, it is suitable for the formation of avenues, living fences, has sufficient frost resistance, to survive in the conditions of Central, effectively cleans the air. Experienced growers prefer the most practical and rational method – reproduction sprigs-cuttings. The method is very long and troublesome: from planting the seed before planting seedlings in the ground is not less than five years. In the process of growth and development of the young tree may lose all its varietal diversity, run wild. On the plus side, the seedling will be as zoned, prepared for local growing conditions. 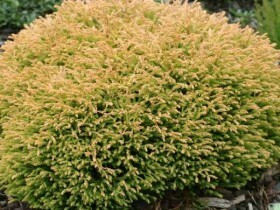 Arborvitae seeds to the soil undemanding, however, for planting is best to use a nutrient, loose soil, composed of a mixture of coniferous and leaf, sand. For planting is best to choose sturdy seeds, which wintered under the snow, this process will harden, prepare for further development in not the most favorable climatic conditions. Selected seeds are planted in boxes with a nutrient soil and sprinkle a layer of the earth, mixed with coniferous sawdust. The procedure is carried out in the spring, for seedlings you need to follow: cover from the sun, remove weeds, pour, fertilizing. Five years later, the seedlings can be transplanted to a permanent place on the site. Reproduction arborvitae seeds. Planting two-year seedlings for rearing. Well propagated by cuttings, the most Northern conifers: fir, pine, juniper. In this way, the trees retain their grades. For separation of shoots, the best month is April. The perfect stem is escape two or three years of growth, obtained from the upper part of the crown. Pruner is better not to use, and try to pull the handle with your hands. The length of sprouts – about 20 cm. At the end of the branch when pulling to keep the piece of wood, the so-called "heel", it is rich in nutrients and will help to drive new sapling growth. You can prepare the cuttings in June, when the plant will go through a second growth period, but this planting material will be ready for the season later. Small twigs, located in the lower part of the cuttings, it is better to remove shears, to avoid rotting in contact with the soil. Cleared of excess vegetation shoots must be decontaminated: putting them down for a few minutes in a slightly pink solution of potassium permanganate, and then be soaked in any growth stimulant, for example, "Carnivine". For planting you will need boxes with a mixture of sand and garden soil, put on a support of bricks, stones, boards. Containers should be as if in limbo. The bottom of the drawer it is necessary to perforate, to the excess moisture could drain freely, and to the roots of the plants to flow freely oxygen. Put a drainage layer of small pebbles or clay pellets. Before using the sand it is better to warm up in the tank or a galvanized bucket, and then impregnated with a weak solution of manganese. Cuttings deepened into the soil to half or two centimeters, the ground to seal and moisturize. The next watering is to spend so, to prevent water washed away the soil mixture. The room for growth of the planting material in the winter time should be warm and shady. Shoots are well rooted at a temperature of from +18 to +22 degrees. If the predicted temperature drop, boxes can be insulated by plastic film. In the first two months the young plants must be sprayed, if the room is hot – do it in the morning and evening. Rooted cuttings are planted in open ground in early autumn. This can be done on the open bed, and in pots sufficient, you can keep in the greenhouse. By this time the roots of the trees should grow to 10 cm in length. The soil for seedlings need to be sour, mixed with peat. This "rearing" of planting material occurs within two to three years, plant care at this time is weeding and watering, fertilizing fertilizers. 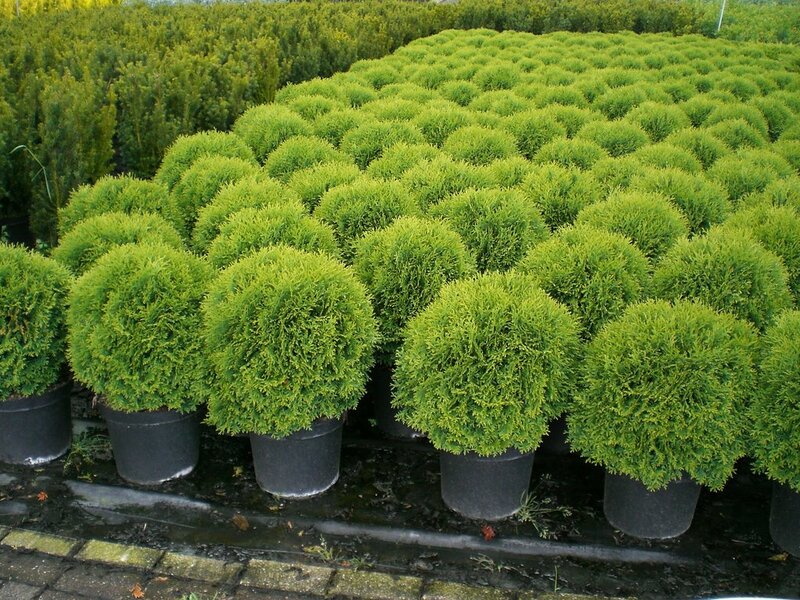 If the conditions or time constraints do not allow to grow seedlings of thuja alone, and quickly decorate the area very desirable – will have to go to a specialty store or nursery and buy ready-made trees. You can buy plants from friends from neighboring cottages, if you trust them, assorted products but still it is advisable to purchase from the professionals. Among the many samples you can choose tempered, healthy seedling, who is "accustomed" to the local climate. Plants from the nursery are usually characterized by size and age: you can buy small and grow them yourself or buy large, ready to plant. When buying, pay attention to the conditions, they lived in seedlings: temperature, humidity, timely watering. Needles should not crumble, she needs to look strong and bright, on the branches there should not be streaks and stains of unknown origin: they may be signs of diseases. Brought home seedlings are better to transplant in the shade and well watered. 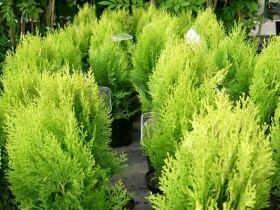 Arborvitae in pots, plants ready for planting in open ground. 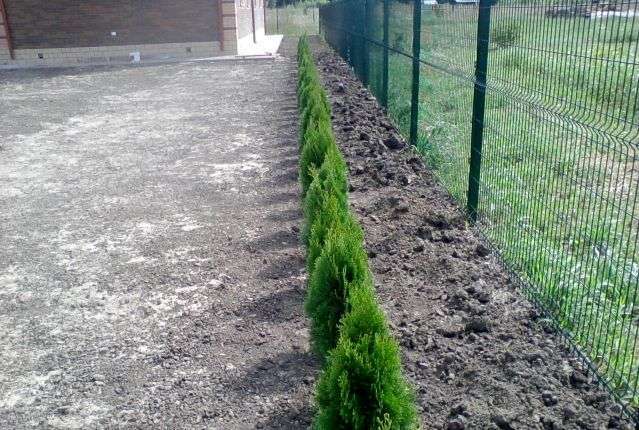 Thuja noble survives well in any time of the year, comfortable to work on the site, but professional gardeners prefer spring planting, tying the development of plants natural biological clock. Trees like the shaded areas, this should be considered when developing landscape project. In the Sunny areas, the plant may wither, it is hard to tolerate cold. 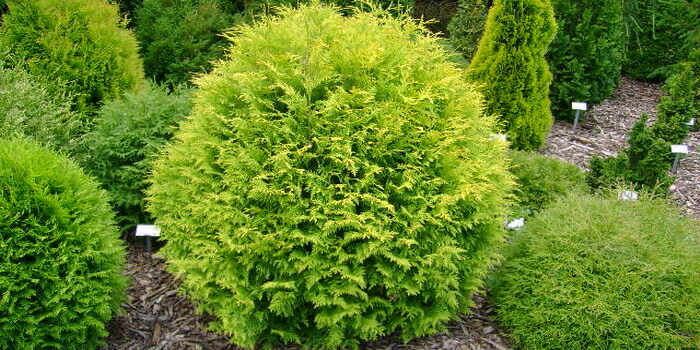 In too shady places thuja also poorly developed, loses its decorative properties. Ideal conditions – light shadow, the absence of draughts, shallow groundwater is located. Thuja occidentalis, the sort of “Danika”. Dig a hole the size 70 on 80 cm, depth meter. It easily should enter the clod of earth with a seedling. Pour on the bottom of the planting pit small amount of soil, mixed with organic fertilizers, for example, with wood ashes. Proportions: 2 – 3 kg of ash per square meter of soil. The seedling is placed into the prepared pit, carefully, the root collar should remain on the surface of the earth. Sleep planted the plant with a mixture of garden soil with peat and sand. The components are taken in equal proportions. The soil is a bit compacted. Spacing between plants depends on the variety and size. Small species of thuja is better positioned at a distance of one meter, large – up to five meters. If there is a need to form a hedge, the plants are planted at intervals of 1 m.
After planting the necessary feeding and watering. As fertilizer gardeners often use growth stimulants, substances help Thue quickly take root and protect from diseases. In the spring of effective half-fertilizing with phosphorus and potassium with a break of two weeks. Watering depends on the weather: in dry periods the procedure should occur two to three times a week, in the cooler months – once a week. The best time for watering – twilight or early morning. During the rainy season, additional moisture is not required. Tuya loves the sprinkler is spraying the crown with a hose with a spray nozzle or spray. Washing away the accumulated dust improves the appearance of the plants, in the air there is a faint smell of pine needles. Daily irrigation is only good. 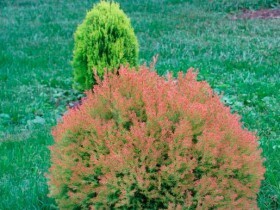 For fertilizing arborvitae responds by increased growth, Shine, the splendor and bright colors of. For feeding use compost or special fertilizer for coniferous plants, this can be done twice – at the beginning of the summer season. Tree trunks of arborvitae needs regular cleaning and loosening. The specified area is mulched with sawdust or compost, this procedure not only improves the fertility, but it also protects from weeds, retains moisture. The ground you can also sprinkle the chips or shells from walnuts. for the growth in width is cut the tip of the crown. 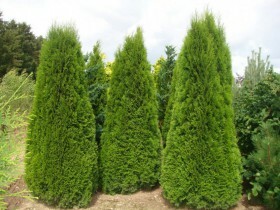 Thuja on the site. Example of landscape design. Using the art of cutting wood can be shaped in any form, this is often geometric shapes – pyramid, ball, cube or column. The most skilled gardeners turn plants into shapes of fabulous creatures, animals. The hardy Western arborvitae varieties. But they, too, need to prepare for the winter season. Development and conservation in the harsh period provided abundant and timely autumn watering. Young trees in the first years of his life in the open ground need insulation covering materials. Gardeners use spunbond, greenhouse film, special covers. Formed transparent "cocoon" keeps you warm, when it transmits the sun's rays. To protect the root systems use fallen leaves, the remaining after the spring cleaning of the site. Adult TUI is sufficient to protect from snow and wind. Gently pull the branches to the trunk, so they do not snow. 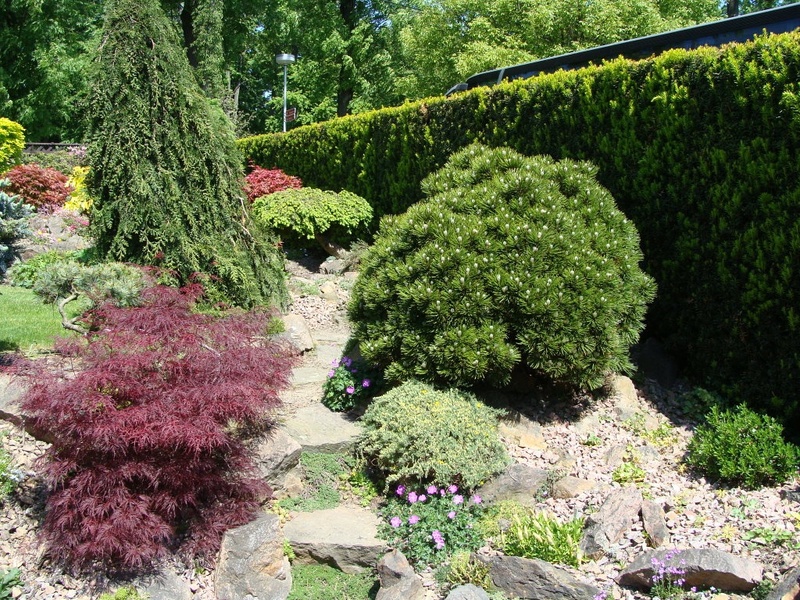 Proper care of the thuja allows you to get a wonderful plant for decorative rockeries and walkways, flower gardens and Alpine gardens. 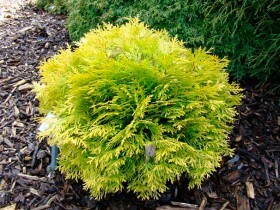 Arborvitae dwarf, a sort of “amber Glow”. A variety with a reddish color “fire chief”. Thuja occidentalis, the sort of “Smaragd”. All content on this site SamDizajner.ru written specifically for Simdesigner, copying 1 in 1 strictly prohibited. Reprint, full or partial rewriting of the article “Arborvitae – plant-survivor”, possible, only when you specify the full, active link to the source.